I’ve been really looking forward to Cat and Ben’s wedding. After meeting them both earlier in the year I knew I was in for a lively, fun filled day and I wasn’t disappointed. I started the day with Cat and the girls at her parents house in Liverpool. It was a full house with lots going on! And the Facebook updates were frequent. I had a fun morning with Cat and friends. As always time starts to evaporate as the ceremony closes so it was time for Cat to don her beautiful wedding dress. I had time for a few bridal portraits of Cat before heading off to St Winifred’s, Neston in Cheshire. I arrived at St Winifred’s, Neston and caught up with Ben and the guests. As expected Ben was in good humour and having a good laugh with everyone. A first for me, Cat arrived at St Winifred’s ahead of her bridesmaids! It took a few quick phone calls to locate them and the day could continue. Sadly Cat’s sister was the other side of the world yet still got to walk down the aisle with her courtesy of iChat on her iPad! Its great when technology can bridge the gaps. St Winifreds is a lovely church and photographer friendly. I was able to photograph Cat and Ben’s wedding unhindered and capture real memories they’ll treasure always. After their service, we headed off to Thornton Hall Hotel & Spa for their wedding reception. It’s a lovely four-star hotel in Thornton Hough, Cheshire with immaculate grounds on all sides. The stunning grounds made a fantastic backdrop for their wedding photos and the weather was on side all day too. After the wedding breakfast, we were treated to a set of great speeches, a real laugh! Cat and Ben made full use of the Thornton Hall Hotel & Spa dance floor with a well rehearsed first dance to a cool acoustic cover of a classic Foo Fighters tune by Boyce Avenue. 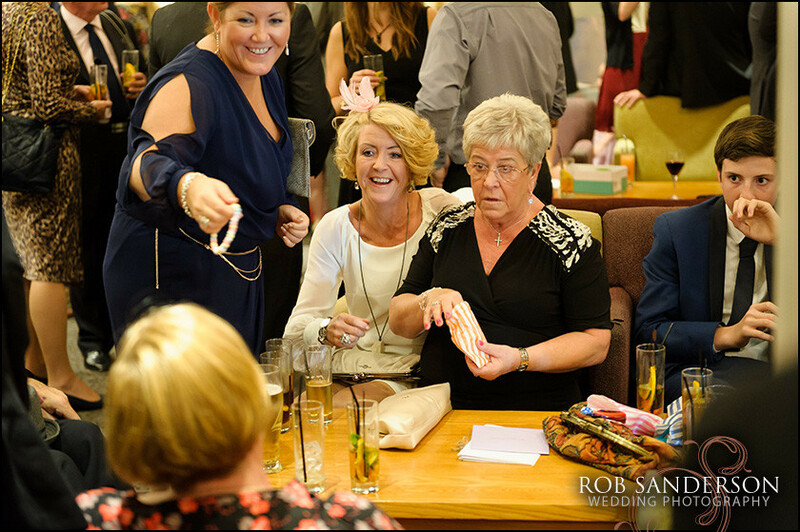 Cat and Ben’s were a lively, fun and friendly couple it was a joy to photograph their Cheshire wedding. St Winifred’s, Neston in Cheshire was completed in 1843 making it one of the oldest Roman Catholic churches in the Wirral. Cat and Ben’s wedding hit the blog over the weekend so thought I would share it here too. A fun set of images for a fun couple.